Kolkata is not just a city, it is an emotion that you need to experience and celebrate. Be it the glorious cuisine of the land, the heritage structures dotting the landscape or the religious monuments defining the region’s cultural integrity, the capital city of West Bengal exudes a matchless charm that is hard to resist. 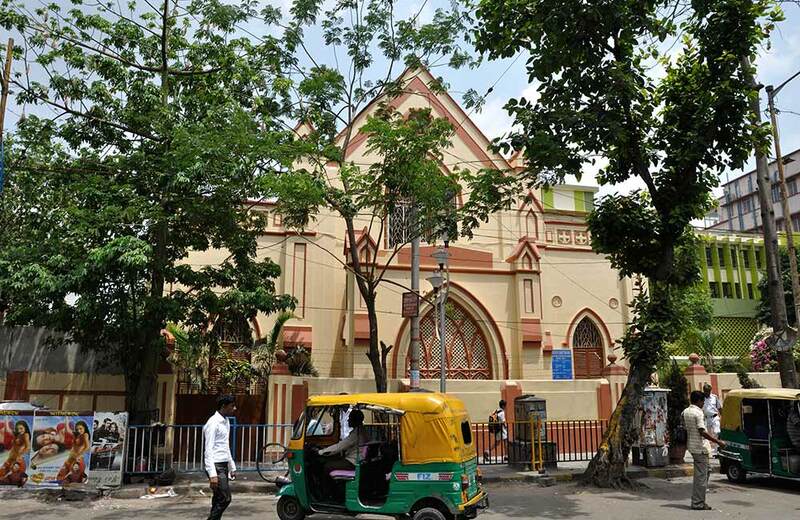 Talking of religious places, the churches in Kolkata are an integral part of the city’s historical and spiritual fabric. These sanctums of worship are an ode as much to faith as to marvelous art and architecture. Whether you are a religious soul or not, a visit to the magnificent churches of the city will leave you fascinated and delighted, all at the same time. Excited to know more? Read on. In this blog, we give you a list of the churches in Kolkata that you must include in your itinerary. 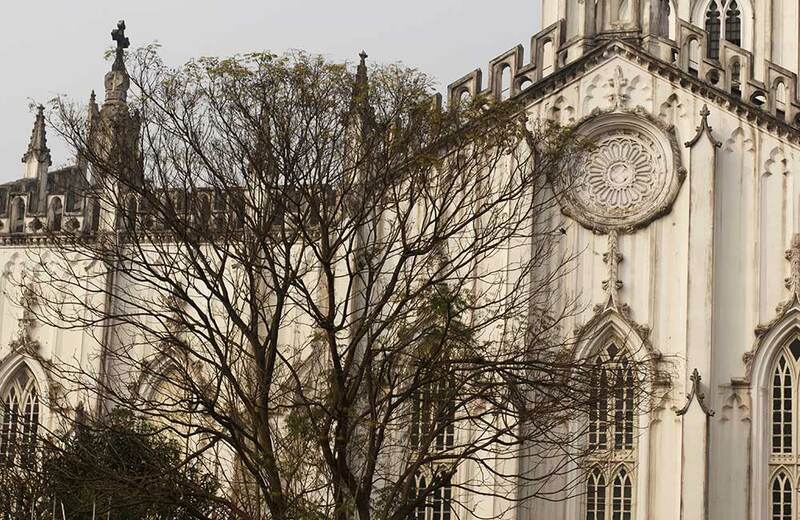 Arguably the most iconic church in Kolkata, St. Paul’s Cathedral is a grand statement in Indo-Gothic architecture. The shrine, dating back to 1847, is regarded as the first Episcopal Church in Asia. With a length of 247 feet, a width of 81 feet, and measuring 114 feet at transept, this cathedral stands as the biggest church in Kolkata. What’s more, it also boasts a 201 feet high tower while its flagstaff is 175 feet in height. But more than the size, it is the artistic beauty of the structure that attracts the attention of visitors, making it one of the most popular places to visit in Kolkata. The main hall of the cathedral is furnished with tastefully carved wooden pews and chairs. Intricately designed stained glass windows, fascinating floral patterns on the walls, and two frescoes crafted in Florentine Renaissance style enhance the beauty of the church interior. The best time to visit the cathedral is on Christmas Eve when it is decked up in a way that matches the festive spirit of the season. Another majestic structure adorning the landscape of Kolkata is the Church of Christ the King. One of the best churches in Kolkata as far as architectural splendor is concerned, it is located in the busy Park Circus neighborhood. But, as soon as you step inside the beautiful building, you enter a world of serenity that seems to be eons away from the hustle and bustle of the world outside. While the exterior of the church is a sight to behold, the interior is no less inspiring. The huge church is big enough to seat hundreds at a time. If you happen to come to the city during Christmas, make it a point to visit this shrine and attend the midnight Mass here. You will definitely go back with a lot of delightful memories of the beautifully decked up building and the wonderful mass attended by a large gathering of devotees and tourists alike. 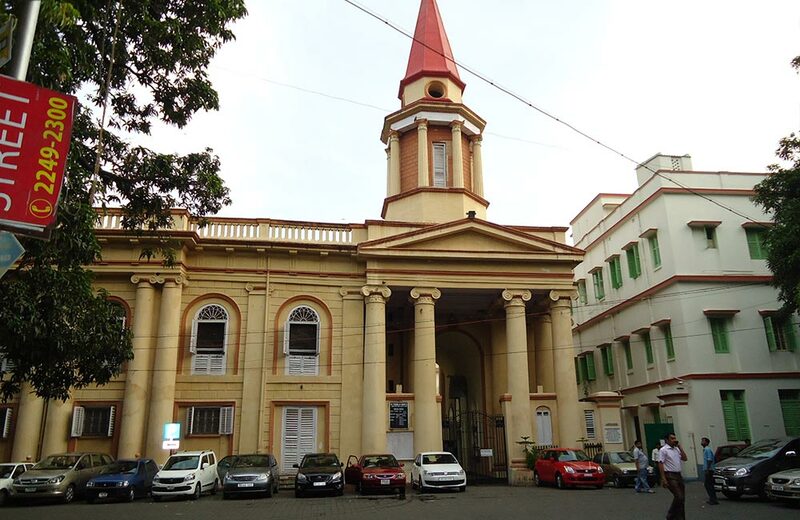 Armenian Church of the Holy Nazareth was built in 1724, which makes it one of the oldest churches in Kolkata. Over the years, this church has been witness to many changes in its design and structure, but it has always stood as a landmark destination in the city. The present shrine was built by Agha Jakob Nazar after the previous Armenian Church dating back to 1688 was destroyed in a fire. As far as artistic beauty is concerned, this Armenian Church Kolkata scores pretty high with its all-white pristine exterior. Surrounded by lush green jamun and mango trees, the structure forms an impressive sight. Its interior is ornamented with beautiful paintings and frescos on the walls. Though it is located in one of the busiest localities of the city, the ambiance inside exudes complete serenity and tranquility. An oasis of beauty and serenity – that’s what best describes St. Thomas Church. 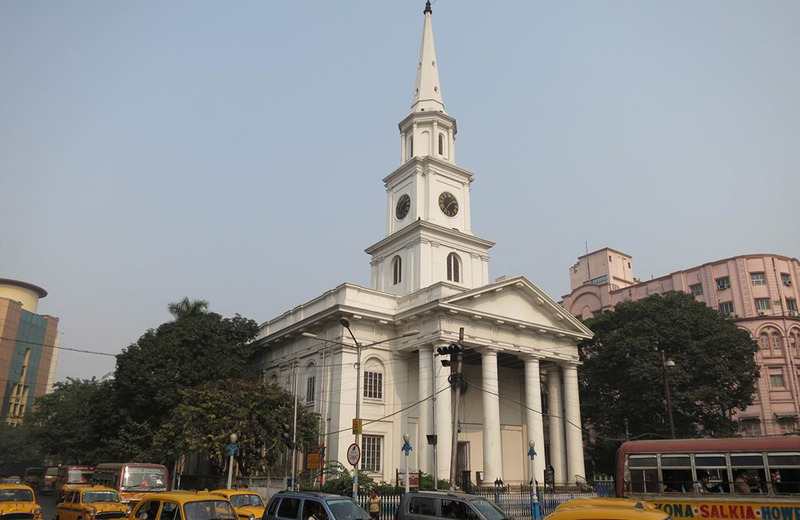 This church in Kolkata is an excellent example of classic colonial construction. It exhibits the colonial style of architecture, complete with a huge tower that immediately attracts the attention of visitors. The interior of this impeccably built shrine is as impressive as the exteriors, if not more. A majestic altar remains at the heart of the church’s grand interior. High ceilings, large windows, and magnificent paintings on the wall enhance the overall beauty of the place. 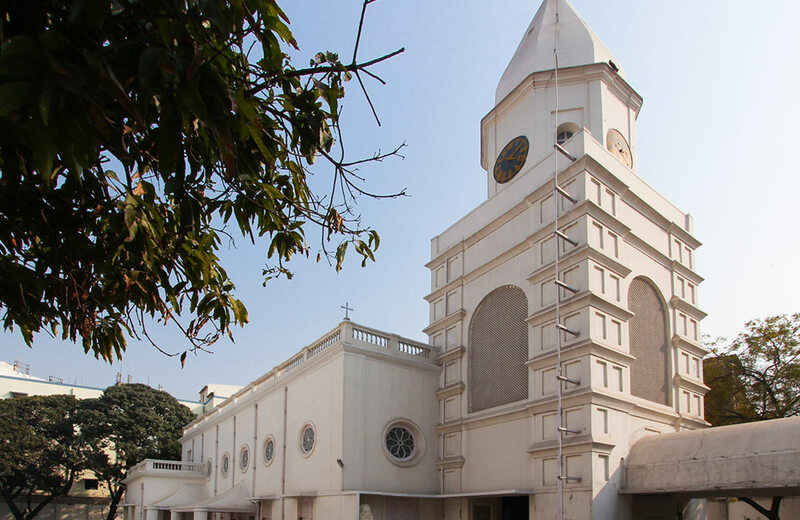 What adds to the historical significance of this famous church in Kolkata is the fact that the body of Mother Teresa was kept here for about a week, in 1997, before her funeral ceremony. The church is located in one of the poshest entertainment areas in the city. While you are in this neighborhood, do not forget to check out some of the most famous restaurants in Kolkata located here. 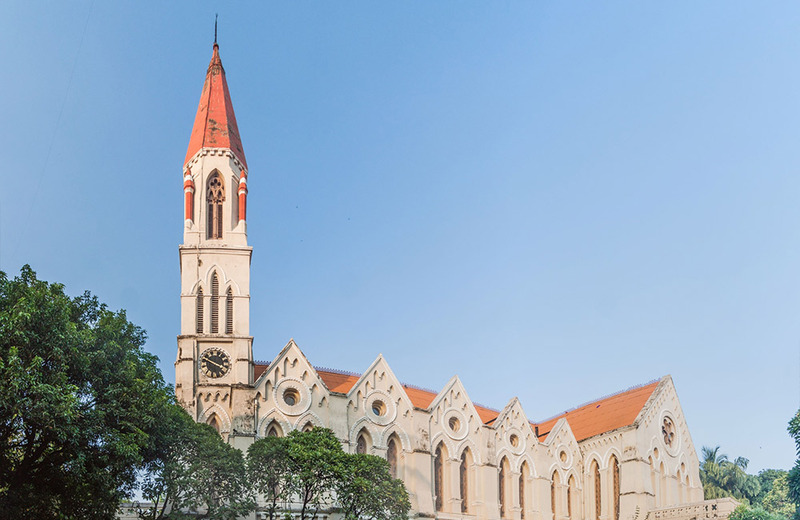 Once the Anglican Cathedral of Calcutta, St. John’s Church dates back to 1787. It boasts of being the third oldest church in the city, and it preserves its history and heritage with care. That’s not all! St. John’s was among the first public buildings to be constructed by the East India Company after they made Kolkata the capital of British India. Since the building was built using stones and bricks, it came to be known as Pathure Girija (Stone Church) among the residents. The square structure of the church is designed according to the Neo-Classical architectural style. Among the main highlights of the shrine is the stone spire that has a height of 174 feet. A giant clock adorns the spire that is wound every day. Another attraction of the church is the famous Last Supper painting by British artist, Johann Zoffany, which you can see at the left side of the altar. Since the church stands on a piece of land that was once a graveyard, several graves can be seen inside the complex even today. The grave of Job Charnock, the founder of the city of Kolkata, can be seen here. The Black Hole Monument and the Second Rohilla War Memorial are the other major things worth seeing in the church complex. Steeped in history, St. Andrew’s Church is regarded as the first and the only Scottish Church in the city. A lovely white structure established about two centuries ago in 1818, this place of worship highlights the fact that beauty lies in simplicity. Its tall spire attracts attention from far off, serving as one of the most distinctive landmarks of Kolkata. St. Andrew’s offers a soothing sight to the eyes. Not just devotees and believers, even tourists flock here to enjoy the beauty and serenity of this impressive shrine. If you wish to explore other religious destinations in the city, check out our blog on temples in Kolkata. St. James’ Church is locally known as Jora Girija which translates into twin church. True to the moniker, the church edifice consists of two identical spires dominating Kolkata’s skyline. It is a colonial-era church that traces its origins to 1862. The architecture of the building follows the Neo-Gothic style. When you step inside the church, a long passageway will lead you to the majestic altar. The impressive black mahogany woodwork adorning the ceiling of this shrine is a treat for the eyes. Although the Greeks left the shores of Kolkata long ago, some of their monuments still exist in the City of Joy. One such monument is the Greek Orthodox Church of India, located right next to the Kalighat Tram Depot. 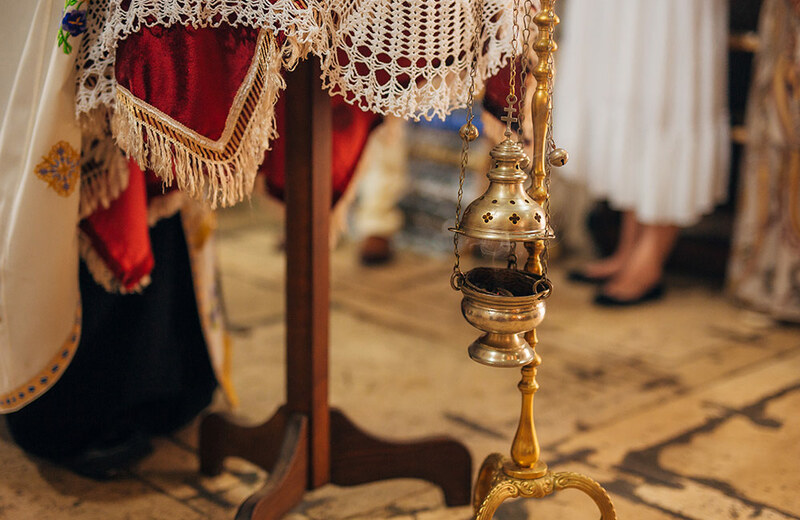 And guess what, if you ever happen to attend the mass here, you can find the readings and proceedings being conducted in Koine Greek, the traditional Greek dialect! Even though the oldest place of worship constructed by the Greeks in Kolkata dates back to the 18th century, the Greek Orthodox Church is less than 100 years old – it was built in 1925. The grand structure, exhibiting four Doric columns, looks more like an ancient temple than a church…kind of like the Parthenon. Adorned with massive chandeliers and wooden pews, the interior of the building paints a picture of grandeur and elegance. Made of polished wood, the altar is adorned with painted panels. There are several paintings of Christ and his transfiguration adorning the walls of the church. 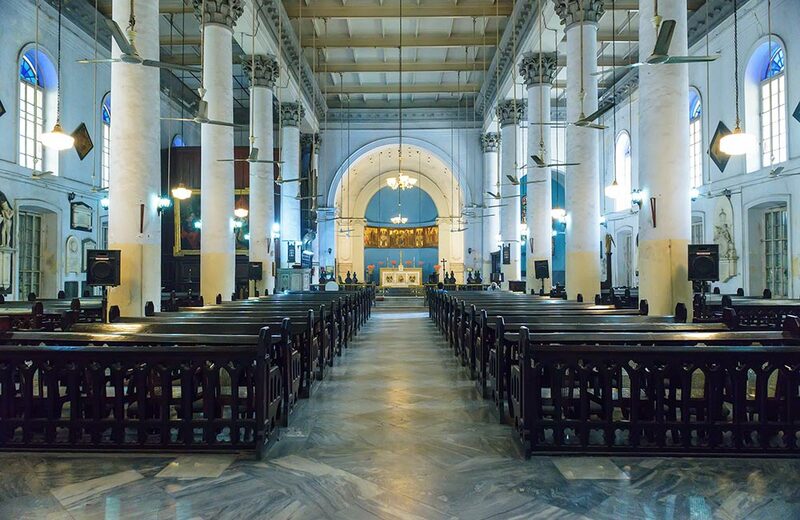 This edifice may not always feature in the must-visit Kolkata church lists, but it is definitely worth a trip. Much like the museums in Kolkata, the spellbinding churches of the city are also places where links to history and heritage can be found abundantly. These churches are the cultural legacies of the city that lend it a unique flavor. If you are interested in such treasure troves, it’s time you packed your bags and start exploring the cultural delights of the city. Trust us, you will find the whole experience worth your time and energy.